Home » Blog » How To » How to Install a Doggie Door in a Wall – Know the Best Way? If you are fed up of allowing your furry friend in and out of the house, then no need to worry at all. You and your loving pooch can enjoy the comfortable life by installing a dog door. You can install the doggie door in the wall or fit into an exterior door. They are available in different sizes so you can fit whichever suits to your pet. You must be thinking how to install a dog door in a wall so that you and your pet’s life get enough easier and comfortable. Let’s proceed further to explore the ways regarding setting up of a doggie door. Before moving to the ways of installing the doggie door in the wall, make the list of the things required to put in the dog door so that you can arrange the things beforehand. You need the measuring tape, drill, silicone caulk, stud finder, nails, lumber, jigsaw, pencil, hammer and carpenter square. Look for a place where you can easily get the access to your pet freely on both the sides. Above the door, there should not be anything intrusive with the coverings. After finalizing the place, you can trace the wall nails in the wall with the help of stud finder. Take a measuring tape to know the shoulder height of your dear pet. For a single flap, wall mounted doggie door, you have to place the door above the shoulder height of 1 ¼ inches, and for double flap dog door, you have to consider 2 inches. The location where you will install the doggie door you can keep your pet against the wall. While you draw around it make sure you hold it in the appropriate place. Form a plan where you have to make use of screws. Choose the area between wall studs and the place free from plumbing and electrical wiring. Make a use of the marks to draw a horizontal line. Take a jigsaw to form the opening of the door by cutting through the interior and exterior walls. For installation of the door, you can draw a rectangle with the dimensions. On the instruction sheet, you will get the knowledge of dimensions. To the size of your door opening cut the small pieces of wood and then on the sides, top and bottom of the opening hammer the pieces of the wood. Organize it in the way you do for the regular door. Ensure your frame is square and level with the help of carpenter square. To know whether the fitting is appropriate you can place the door inside the opening. It will guide you in forming the rough idea. Take drilling machine to drill the holes where you can screw to set the door. Make use of the screws to fix the door. With the doggie door, you must have found the screws too. Now to have water and weatherproof seal around the door opening you can make use of spread on silicone fill. Allow your pet to enter and exit from the door so that you can make out the size and placement of it. Initially, your pooch is finding the door uncomfortable to use as he has not experienced it before then you can make use of some appealing treats to motivate your pet. Once your beloved pet gets accustomed to it, then he can develop the habit of using it. 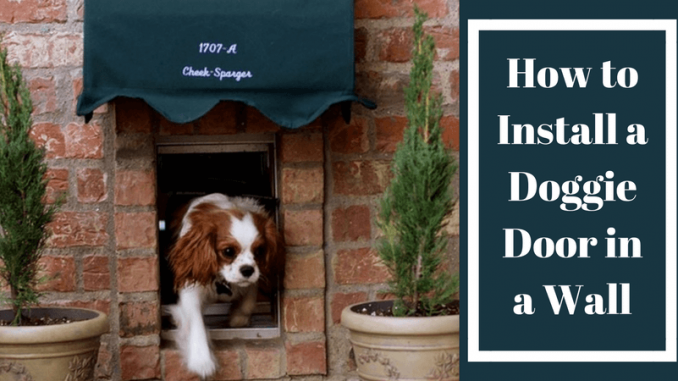 How are doggie doors helpful? From this post, you can easily make out how to install the dog door. You will experience that installing the doggie door is neither challenging and cumbersome task nor expensive too. It will provide safety and freedom to your pet without giving you extra pain or trouble. Make sure that it suits to the size of your pet so that he finds it comfy to stay. So by following the steps mentioned above, you can easily install the dog door in an exterior wall. It will be ideal for you as you don’t have to always check his ‘in’ and ‘out’ of the house.